Heinrich Marschner, lithograph after a drawing by F. A. Jung, c. 1830. Heinrich August Marschner (Zittau, 16 August 1795 – Hanover, 14 December 1861) was the most important composer of German opera between Weber and Wagner. To the extent that he is still remembered, it is largely for his operas Hans Heiling (1833), Der Vampyr (1828) and Der Templer und die Jüdin (1829), extremely popular in his lifetime. 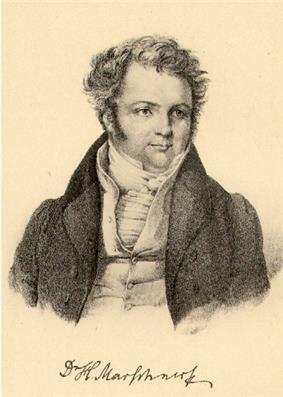 Marschner's ability to depict supernatural horror by musical means is especially evident in the first two operas as well as in some of his ballads, such as "Die Monduhr" (c. 1839). Next to his operas, Marschner's most significant musical contribution is to the Lied. The best of his works in this form are comparable with those by Carl Loewe. He also wrote a considerable amount of chamber music, including seven piano trios, as well as unaccompanied male choruses that were very popular in the nineteenth century. While Marschner’s operas strongly influenced Wagner, his chamber music, songs, and his cantata Klänge aus Osten (1842) were admired by Schumann, whose cantata Paradise and the Peri (1843) shows the older composer’s influence. Marschner’s Bagatelles for guitar (1814) have been taken up lately by some guitarists, and some of his chamber music is still very occasionally played. Among his operas, Hans Heiling and especially Der Vampyr have been adapted and revived in recent years with considerable success.